My Middle Eastern heritage inspired me to make this healthy homemade pizza... With a fragrant sourdough crust from ancient wheat einkorn, crumbled goat cheese, kalamata olives, and many more toppings -- this Mediterranean pizza is a FEAST of savory veggies and herbs for even the most avid pizza lover! The morning of or the night before, prepare sourdough pizza crust of choice. When ready to make your meal, pre-bake crust according to its instructions. Combine olive oil, thyme, and oregano in a small dish. Brush the oil paste over the pre-baked pizzas. Sprinkle about a 1/3 cup of the mozzarella cheese over each pizza. This will help your toppings stick to the crust. 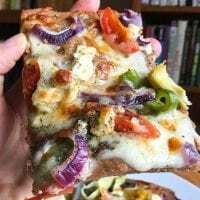 Add the rest of the toppings, except the remaining mozzarella -- crumbled goat cheese, red onion slices, quartered grape tomatoes, black olive slices, bell pepper slices, and halved artichoke hearts. Divide the remaining mozzarella between the two pizzas. Sprinkle each pizza with ground black pepper. Pop pizzas back in the oven at 450 degrees Fahrenheit for about 10 to 15 minutes, until cheese is crispy in places and bubbly. Let cool slightly before cutting into slices. Enjoy!